Neither of the lenses protrude from the metal body. 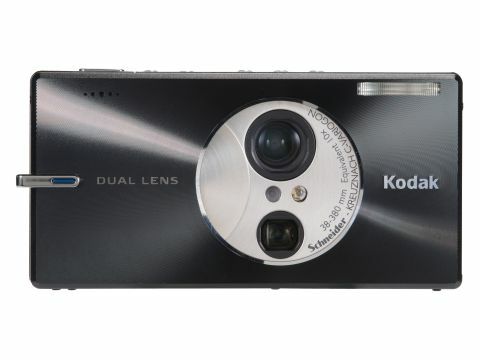 By dividing a 10x zoom in two and squeezing it into a compact casing not much larger than a mobile phone, Kodak's V610 looks set to divide critics as much as the equally wacky and inspired V570. The V610 has separate 38-114mm and 130- 380mm lenses and, despite looking similar to the V570, this latest dual lens, dual sensor digital camera is roughly one quarter larger than Kodak's first version. Maximum resolution has usefully been increased to 6 megapixels, and it features Bluetooth technology to transfer images wirelessly. Despite what you may be thinking, in operation you don't get the bizarre sight of two zooms extending from the body and lunging back and forth like cobras' heads. Both lenses are internally folded so they don't protrude from the metal body. An on-screen slider denotes where you are between wide angle and telephoto (and so which lens portion is in use at a particular time), jumping between them as you press down on the zoom toggle. When not in use, the optics are neatly hidden by a protective cover. Flip it over and the rear of the camera recalls a gaming console, with a 2.8-inch screen dead centre, flanked by controls: the aforementioned zoom and four-way control pad to the right; and a row of buttons for key features to the left. These include 22 scene modes - displayed as a series of icons with supporting text - plus self-explanatory Delete, Menu and Review modes. As with other Kodaks, there's a dedicated Share mode for earmarking images for print or email. A row of further controls for Flash, Video and Favourites across the camera top are illuminated by a funky blue light upon power up. The large LCD, situated in-between, inevitably attracts fingerprints but, overall, build quality's high and the camera feels worthy of its price tag - it's reassuringly weighty in the palm of your hand. In addition, the V610's quick to power up, with a wait of just over a second before it's ready to take a shot (although it does then take around five seconds to commit a maximum-quality image to its 32MB internal memory or SD card slot). Unfortunately, when it comes to examining the pictures produced, the V610 doesn't come away with a clean bill of health. At extreme wide-angle setting there's notable fall off of sharpness towards the edges of the frame, while at maximum telephoto it's almost impossible to avoid camera shake when shooting hand held. Image noise also appears to be a problem in low light without flash at whatever sensitivity setting you choose. Most of the time you won't be able to tell this when you look at the LCD - defects only become visible when reviewing shots larger on a computer, when the moment's long gone. The V610's unusual set up comes with compromises, the omission of optical image stabilisation being the most serious, given its long zoom USP. On a more positive note, the Bluetooth functionality went down well at a family gathering, where snapshots of the day were transmitted to the guests' mobile phones. Although the V610 doesn't always locate compatible devices on first attempt, it only takes a couple of tries before you've got images firing off through the ether. Should Kodak get everyone using its in-store kiosks to make prints as it hopes, the Bluetooth route will no doubt be taken in preference to removing memory cards or burning CDs.